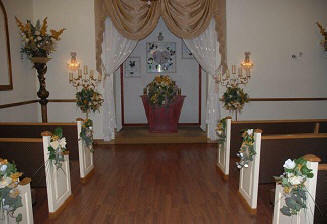 Chapel 1 Located at The Howard Johnson Inn and Suites offers five wedding packages to choose from, starting at $129.00. Ceremonies are performed between the hours of 10:00 a.m. until 10:00 p.m. 7 days a week. 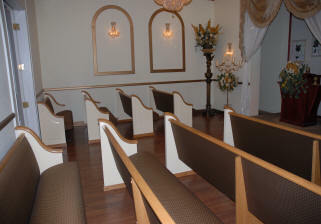 This beautifully decorated wedding chapel has quickly become one of the most popular wedding chapels in Las Vegas. Some of this cute wedding chapel amenities include seating for up to approximately 35 guests, stretch limousine service, friendly professional staff, a Free Live Web Cam, and an outdoor gazebo for additional photos. Friends and family may also take photos and video at this wedding chapel location, for no additional charge. * Minister work for donations, $50 and up suggested. Drivers work for tips $40.00 and up suggested. Limousine service from your hotel, to the chapel and back to your hotel. Limited limo service area, Strip vicinity (Las Vegas Blvd.) and Downtown hotels. If unsure if your hotel is in our limo service area please call. Prices do not include tax or $10 handling. Balance is due 7 days prior to wedding ceremony. Weddings booked within 7 days of ceremony, requires package payment in full. ©2013 Chapels of Las Vegas, Inc.